After a long break in writing these- I’m back on the wagon. A very hot and sticky morning didn’t deter 4 PAX (Archive QIC, Captain Crunch, Banks, Tortuga) from working hard enough to smoke yours truly in his attempt to Q. Can the Q call his own 10-count? I did. Warmup- 7x Motivators, 15x Imperial Walkers, 15x Windmills. PAX does AMRAP of called exercise until someone hits 100 reps. Thanks for a good day of work together- coffee with Captain and Tortuga was awesome. See you in the Gloom. Prayers for rest / stamina in the Archive house. Prayers for patience / wisdom in the Crunch house. All fine on the Banks front this week. 6.14 Superman Vs. Superman Returns! The early light of Thursday saw two PAX meet at AO Mastodon, ready for a challenge. The goal: to not be the last guy done with the Super 21. The price of failure: doing 21 reps of whatever the other guy called. Crunch called Absolutions, Archive raised it to Bodybuilders, and we got down to it. Prayers for rest, patience and endurance for Archive’s family as they weather Baby #2’s first months of sleeping and not sleeping. Prayers for Crunch’s ability to lead his team at work; patience, endurance and wisdom in guiding the children to completion on their potty training. Lifted up Junior and his family with the arrival of baby #3 to their house. Lifted up LightsOut as a member of his family begins chemo. Prayers for the brothers present and at large. Thought for the day: One has not lived, until one tries to Boat/Canoe immediately after 231 sit-ups. 1 Pax (Archive) toted himself to a very soggy AO for a self administered beatdown. 3 x to top of the hill. 15x bicep curls at top, 5 x merkins at the bottom. Never thought my fingers could get this tired…. Thang 2- 1.5 mile run 8 minute pace. 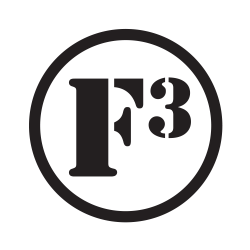 I feel really grateful for the ability and motivation to get up and work out every F3 day. I’ve never made it more than 3 months or so into a commitment to work out- it’ll be 9 months this coming Saturday. I’m in the best shape of my life and I’ve spent time with some inspiring dudes. Here’s to another 9 months. See you all out there.